It is Lombard Street in San Francisco and it is one of the legendary tourist destinations in the world. It is widely known as the “Crookedest Street in the World” but the residents of this formerly quiet neighborhood have been up in arms of late. They are demanding that the government of San Francisco do something about the tourist situation. This beautiful neighborhood has recently begun to take on the appearance of an amusement park and residents have had enough. The city government has decided to take action and have formulated several plans. They are considering charging some sort of fee or admission to the area, redirecting people to take the cable cars or travel the street on foot and to expand parking facilities at the outskirts of the neighborhood. 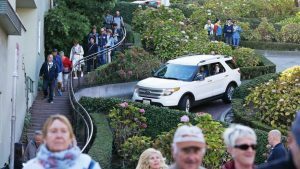 At the height of the tourist season, generally in the summer, as many as 6,000 tourists will flock to Lombard Street in a single day. That’s as many people as can be found in a small MidWest or New England town. While tourism has flourished there for many decades, it has only been in the last half dozen years or so that it has become a mob scene. 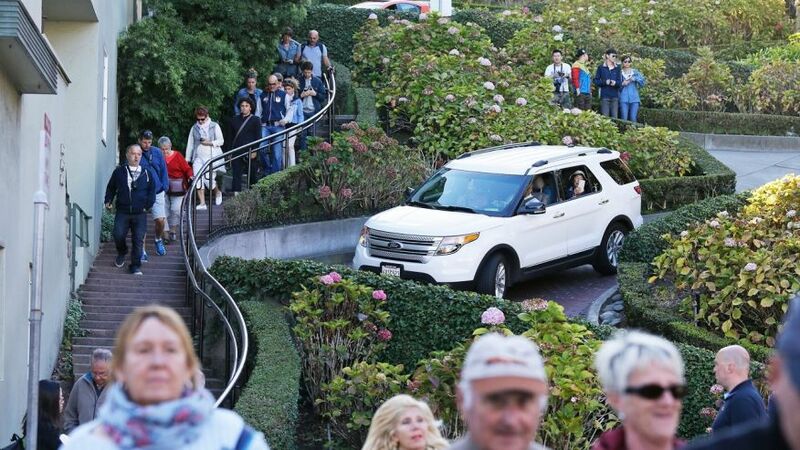 Cars waiting at the top of Lombard Street to cruise the curves can be backed up for three or four blocks causing havoc in the bordering Russian Hill neighborhood. The street was originally constructed in 1922 and engineers made it so crooked because the vehicles back then never would have had the engine power to have made up the steepness of the hill. Residents, over the long years, created and maintained the surrounding gardens. One of the latest nightmares for residents are the tour buses. They pick up tourists at the surrounding hotels and don’t come back for them for a couple of hours. It has just added to the deluge and congestion. All of those tour bus people hang around, say neighborhood residents, because it isn’t costing them anything to do so. Residents are sick of the trash they leave behind and the damage they do to the flowers and many have used resident’s doorways to relieve themselves. Also, robberies and break ins to vehicles have risen sharply in the last few years. What the residents really want to see if the government to come in an build the facilities needed to handle the crowds such as security and tour guides and portable toilets.